Our doctors can help you enhance the aesthetics of your smile with cosmetic dentistry. A smile makeover has the power to rejuvenate your face and dramatically boost your confidence. A+ Plus Family Dentistry offers full cosmetic dentistry services, including porcelain veneers, crowns, orthodontics and teeth whitening. Our doctors make sure your new smile will not only be beautiful but also healthy. As an initial step, they will address any health or bite alignment issues to ensure that the results of your cosmetic treatment will be long-lasting. Our doctors will really listen to you in order to understand your concerns and smile goals. They will create a treatment plan that fits your needs and budget, and they will explain every step in detail and answer any questions you have. The doctors are highly trained in aesthetic and restorative dental procedures, including orthodontics and dental implants. 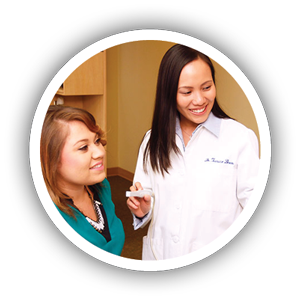 Additionally, Dr. Tran, Dr. Justene and Dr. Janice have all completed the Spear Study Club Cosmetic Dentistry curriculum through Spear Education, a leading dental institute. Our doctors also take regular continuing education courses in cosmetic dentistry to keep up with the latest technologies and procedures in the field, so they can always provide you the latest that cosmetic dentistry has to offer. We welcome you to come to our office for a complimentary cosmetic consultation. The doctor will meet with you and develop a treatment plan that fits your smile goals and budget. 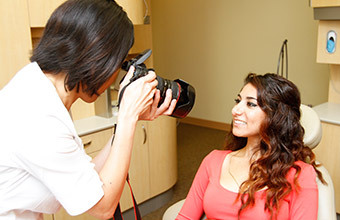 Photos are taken to help in the planning of your new smile. Treatment plans can vary depending on the patient’s individual needs and goals. Below is our general approach to smile makeovers. 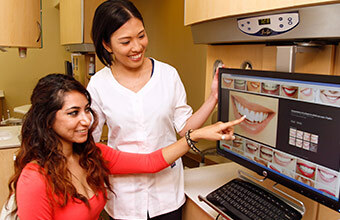 Treatment begins with thorough diagnostics, including digital X-rays and intraoral and extraoral photos of your smile. 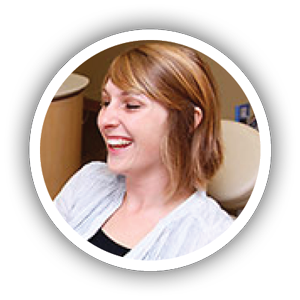 You will have the opportunity to look at our before and after pictures of previous patients to help you determine how you want your new smile to look. 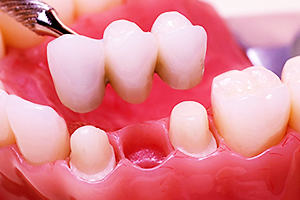 We will take an impression of your teeth to make a study model of your smile. We will mount this model on a device called an articulator, which simulates biting motions, to make sure that your teeth are well aligned and the bite is correct. For more extensive cosmetic cases, we will have the lab create a model of what your final smile will look like. This is known as a “wax-up,” and it is made out of tooth-colored wax. The doctor will use the wax-up to make sure you’re happy with the proposed final look before treatment begins. The doctor will prepare your teeth and take impressions that will be used by the lab to create your final restoration. The doctor will then place a temporary restoration that you will wear while the lab is manufacturing your final restoration. The lab will fabricate the restoration within two weeks. When we receive it at our office, the doctor will place your final restoration. 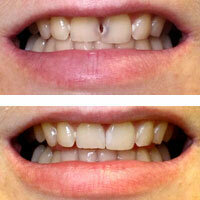 We offer same-day veneers to patients getting multiple veneers. The final veneers will be designed and created in our office and placed by the doctor all in one day. One-visit crowns are available at our Poway office. We offer powerful in-house whitening options from Zoom and Opalescence as well as an Opalescence take-home treatment. Veneers are thin layers of porcelain fixed to the front surfaces of your teeth. Our doctors use them to permanently whiten teeth, close gaps, change the shape of teeth and even straighten mildly crooked teeth. Dental bonding is a tooth-colored composite resin material used to fix minor cosmetic issues such as chipped teeth or gaps between the teeth. 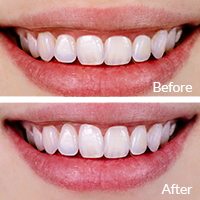 It is a more economical, faster and more conservative option than veneers, although it is not as long-lasting. A crown is an artificial tooth cap used for restoring broken-down or decayed teeth. 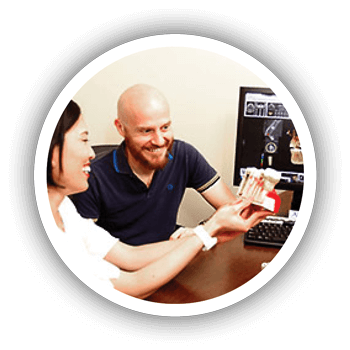 At our Poway location, we also offer one-day crowns designed and manufactured with our in-office CEREC machine. 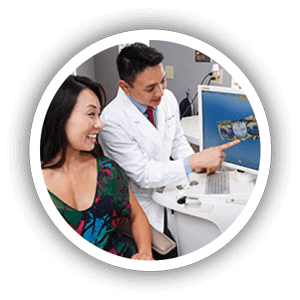 Dr. Justene and Dr. Tran offer cutting-edge braces with advanced bracket technology as well as Invisalign clear teeth straightening. A dental implant is an artificial tooth root that can be capped with a restoration such as a crown or bridge. Implants are considered the modern solution for missing teeth. In some cases, our doctors will recommend a bridge to replace a missing tooth. However, in most cases, they recommend dental implants. 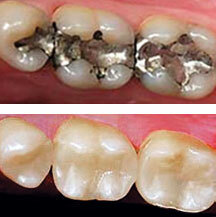 Tooth-colored fillings are an aesthetic, healthier alternative to metal fillings. This procedure utilizes a precise, minimally invasive soft tissue laser to gently reshape an uneven gum line or fix a gummy smile.